If you thought hurdy-gurdy was the catchphrase of the Muppets’ chef, you might be better off leaving it that way. As instruments go, we’re talking about one of the more diabolical contraptions. Imagine a mangle mounted on a cow’s udders and you’re pretty much there. Then imagine the sound you’d get if you fed a cow’s udders through a mangle and you’re pretty much there again. No, we’re not talking security devices at Gatwick. While you manipulate the udders to play the tune, the drone strings sound the same note continuously, creating the impression that someone is trying to disrupt your musical enjoyment by playing a speech by Boris Johnson at the same time. Noyng-annoyng-yoyng-annoyng-noyng-yoyng-annoyng. You notice how close the sound is to the word ‘annoying’. Bagpipes make their ‘music’ on the same principle – unless you’re alert enough to step in and take an axe to them first. 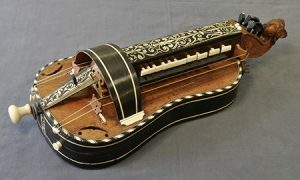 By the 1960s the hurdy-gurdy had become the dodo of the stringed instrument race. You couldn’t find one for love nor money. But then along came Donovan, counterculture icon and mind expanding hippy pal of The Beatles. In 1968 he released Hurdy Gurdy Man (warning: you may find this link upsetting), a groundbreakingly ridiculous piece of trippy psychedelic rock weirdness that featured future members of Led Zeppelin rocking out while Donovan recounted recollections from his latest trip in a voice that sounded like he was being vigorously shaken while trying to order pastries. The song peaked at No.4 in the charts, its saving grace being that, despite the title, there was no hurdy-gurdy on it. Nevertheless, its release was enough to rekindle interest in the fiendish instrument, much as the mere mention of Beelzebub might be enough to invoke the Devil. Before you could say “hey nonny nonny”, the folk movement had got hold of it and once again the woods were full of wan looking damsels in long dresses playing hurdy-gurdies and singing ballads about shipwrecks and Wat Tyler.